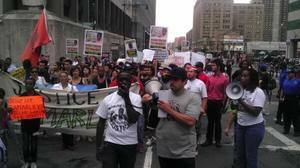 An emergency demonstration was held August 8 to show outrage in response to the grand jury’s decision not to proceed with charges of manslaughter against Richard Haste, the New York Police Department officer who murdered unarmed 18-year-old Ramarley Graham after breaking into his home. Beginning in front of the 161st Street Courthouse in the Bronx, the action received enthusiastic support from the African-American and Latino communities. Constance Malcolm and Frank Graham set an empowering example by leading the protest demanding justice for their son. At the rally, speakers focused on raising awareness of the decision by reprimanding the NYPD for the way the police department, as a whole, continues to harass our communities. The shared sentiment was that Richard Haste was a murderer who was let go by the same racist justice system that had let George Zimmerman’s murder of 17-year-old Trayvon Martin go unpunished. The Justice Committee’s CopWatch coordinated the rally and later the march took the streets and traveled from 161st Street in the Bronx to 135th Street in Harlem, ending in front of the 32nd police precinct. The protest was received very powerfully by the community as it headed down Grand Concourse, a major thoroughfare in the Bronx. The march would occasionally stop to allow the family and community members the opportunity to speak. During these brief rallies, people in traffic showed strong support by honking their horns. This display, along with the growing number of people who joined the march as it went by, made it clear that many people in our communities are becoming conscious of the injustices committed by the NYPD and the complicity of the so-called justice system. By the time protesters reached the bridge on 149th Street that crosses from the Bronx into Harlem, the crowd had grown significantly and the group marched into Manhattan. While marching into Harlem, supporters came out into the streets and were outraged to see the enormous amount of police cars and even busses following the march. The chants of “Whose streets? Ramarley’s streets!” that had roared through Grand Concourse and then 149th Street escalated in Harlem. People who were joining the march explained that they were motivated by the disregard for Black and Latino life displayed by the cops. The march helped people connect the dots between the NYPD and mass incarceration and between Trayvon Martin, Sean Bell and Ramarley Graham – and countless others whose stories are untold. The determination and militancy displayed by the marchers and the community members who cheered them on shows the potential for a sustained fight back against NYPD terror. The ANSWER Coalition and many others will continue their work to build the kind of organization needed to make this a reality.